world’s third highest peak. First climbed in 1955 by Joe Brown and George Band, Kangchenjunga lies in one of the most remote parts of the Himalaya, astride the northeast corner of Nepal and the western frontier of Sikkim. This trek takes us from the rice and tea growing tropical lowlands to the high glaciers, which tumble from the surrounding peaks of Kangchenjunga and visits the south face base camp. We start our journey by flying to Biratnagar in Nepal’s eastern corner. A further flight takes us to the remote Suketar airstrip where we begin our trekking.Our approach to Kangchenjunga’s stunning south face is up the heavily forested Simbua Khola valley. 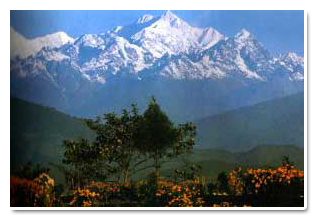 Above the tree line the valley opens to provide amazing close views of the peaks surrounding Kangchenjunga. We will base ourselves at Ramze (4360m) for two nights on the edge of the Yalung glacier. From our camp we have superb views of Kangchenjunga’s south face. We have a day to explore the area further, visiting south face base camp with the magnificent sight of the huge south wall of Kangchenjunga towering ahead. Now we head north crossing the Mirgin, Sinion and Tamo passes to Ghunsa in the Ghunsa Khola Valley. These two days are pure magic. To the west a corrugated land of ridges and valleys lead the eye to a fairytale Himalayan skyline, dominated by the peaks of Makalu, Chamlang and Everest. Our return descends through a fascinating landscape of scattered villages and a patchwork of terraced fields to conclude this magnificent trek. Culture encounter Gurung, Brahman, Chhetri, Rai, Limbu, Tamang and others. Himalayan sights: Himalayan ranges Mt. Kanchanjunga Kumbhakarna, Nepal Peak, Khambachen, Mt. Everest, Makalu, Lotse, Nuptse and many mores. Most Attraction of the trek: Non Touristy route Specially mixed life and very famous blue Sheep. Today we fly from Kathmandu to Biratnagar, the second largest city in Nepal. The flight takes almost 1 hour and if the weather is clear we are treated to some spectacular views of the Himalayan chain, stretching from the peaks of Langtang to the huge bulk of Kangchenjunga, including Gauri Shankar, Menlungtse, Everest, Lhotse, Makalu and Jannu (Khumbhakarna). Overnight hotel. A 30-minute flight from Biratnagar takes us to Suketar (2400m), a grassy airstrip above the large bazaar town of Taplejung. Our trekking crew and porters will be waiting for us on arrival and after lunch we will start trekking with a 3-hour walk to Lal Kharka. The walk takes us through some beautiful mixed forest; our camp is a clearing with one bamboo hut and distant views of Kangchenjunga. Overnight Camp. From Lal Kharka we contour around the hillside passing through a number of small hamlets where the people are mostly Hindu - Chettris and Brahmins. Along the way there are many chautarra's by the side of the trail, stone benches, used by porters for resting their loads. After the village of Tambawa we descend to cross the Phawa Khola on a wooden suspension bridge and stop for lunch. After lunch we climb steeply to Kunjari and then a more gradual climb to our camp at Bhanjyang, a small village on a grassy ridge with tremendous view of the Kangchenjunga massif. (6 hours walking) Overnight Camp. From our camp on the ridge we descend through terraced fields to Khesewa and then climb gradually, contouring through thick, lush forest to Fun Fun, a small village on top of a narrow ridge with views of Jannu, Kangchenjunga and Talung. From here we descend through more terraced fields and by thatch roofed houses where the people grow a great variety of crops including millet, spinach, limes, chilli's, maize and even castor oil trees. Today's lunch stop is in an idyllic spot, by a waterfall and stream, perfect for washing hair, bodies and clothes. After lunch we climb quite steeply for an hour to round a ridge, giving views up the Kabeli Khola and across to the village of Mamamkhe, a small village on the opposite hillside and our camping stop for the night. To get there we have to descend steeply through the small hamlet of Ponpe Dhara, crossing the Kasshawa Khola on a rickety suspension bridge and then climbing steeply towards Mamamkhe, camping on the terraced fields just opposite the village. (6 to 7 hours walking) Overnight Camp. From Yamphudin we continue along the left bank of the Kabeli Khola before crossing the tributary stream of the Omje Khola and begin a steep ascent to the Dhupi Banjyang pass, about 2 ½ hours of steady climbing through open grassland. Near the top we enter forest and prayer flags overhead mark the top. From here it is a steady descent through deciduous forest to the Omje Khola and lunch. After lunch 2 hours of steady climbing brings us to Chitre a clearing in the forest with a single bamboo shelter and our camp for the night. (6 hours walking) Overnight Camp. We continue climbing gently up the Simbua Khola valley. As we near the tree line there are good views of Kabru Peak (7338m) and Rathong (6678m). After 4 hours of walking we arrive at Tseram (3770m), a delightful grassy meadow beneath the Mirgin La. We will camp here as it is important to gain altitude slowly and an afternoon resting here will help with acclimatisation. (4 hours walking) Overnight Camp. A day for exploring the area and relaxing around camp. It is very important to gain height gradually to enable our bodies to acclimatise to the altitude. A second night at Tseram will help enormously, particularly if we have been higher during the day to the height we will be sleeping at. Overnight Camp. We eventually emerge above the tree line following the left bank of the Simbua Khola into yak pastures and glacial moraine. The scenery is magnificent as we ascend to Yalung Bar, the end of the forest line and at Lobsang La the valley opens to give commanding views of Kabru, Rathong and Kokthan. We ascend past the snout of the Yalung Glacier before reaching Ramze at 4360m, camping in a broad flat glacial valley surrounded by towering peaks and grazing yaks! (3 ½ hours from Tseram). After lunch those who wish can explore the area by walking further up the valley or ascending a ridge above camp for even more tremendous views. Overnight Camp. After breakfast those who wish can follow the glacial valley towards the huge Yalung Glacier with spectacular views of Kangchenjunga's south wall. The route by which the mountain was first climbed in 1955 is clearly visible and there are dramatic views all around. There is time to climb the lateral moraine of the glacier towards a Chorten (monument) for better views (2 ½ hours from camp). Ranged in an enormous circle is a fantastic array of peaks. A great sweep of snow crested ridges lead to the rocky pyramid of the main summit of Kangchenjunga. From the last of the Kangchenjunga peaks the ridge sweeps down to form the Talung saddle and rises to Talung Peak and the massive whale back of Kabru. Overnight Camp. We descend to Yalung Bara and then a short steep climb after the river to lunch (2/2 hours). After lunch we traverse above Tseram with great views of Kabru and Rathong behind. Finally a steep ascent to our campsite beside a small lake. (4 to 5 hours walking) Overnight Camp. Today we cross the Mirgin, Sinion and Tamo La's. From our camp we continue climbing to emerge on an open trail with tremendous views back down to the Simbua Khola Valley and across to the peaks rising above the Yalung Glacier, to Kabru Peak and to Kangchenjunga. It takes around 2 hours of steady climbing to arrive at our first pass, the Mirgin La (4550m). The views from here are spectacular, a beautiful spot to rest and eat our picnic lunch. Overnight Camp. From the Mirgin La the trail is much gentler as we contour around the hillside on an easy trail, gently climbing to the Sinion La (4500m). This is a beautiful walk, high above the valleys with magnificent views across ridge after ridge to Makalu and the Baruntse/Chamlang massif. From the Sinion La the trail descends slightly to our last pass, the Tamo La (4500m) and from here we are treated to a tremendous view of Jannu (Khumbhakarna). Now it is downhill to our camp, a beautiful grassy meadow, surrounded by snow-splattered hills with views across the Ghunsa Khola Valley to a tremendous panorama of peaks. (5 to 6 hours walking) Overnight Camp. An easy day descending to Ghunsa, a village situated on the right bank of the Ghunsa Khola. From our camp we descend into beautiful rhododendron forest to enter the village near the school. After lunch we cross to the right bank of the river and descend along forest trails to Phere, a small village with a very interesting monastery. (6 hours walking) Overnight Camp. We continue our descent south, along the river valley towards Taplejung. From Phere the trail descends to the river through mixed forest and bamboo. A short climb brings us to the small hamlet of Kyapra and then on into the bamboo forest where we stop for lunch in a clearing (3 hours). After lunch the track winds its way up and down across the steep hillside, until finally open ground is reached shortly before the small Sherpa hamlet of Amjilassa (7 hours walking) Overnight Camp. From Amjilassa we continue first traversing then descending, steeply through rocky, open pastures towards Ghaiya Bari and the small hamlet of Sakathum (1650m), 4 hours from Amjilassa. Here we have lunch before crossing the Ghunsa and Simbua Kholas and following the left bank of the Tamur River, once again entering an area of lush vegetation and terraced fields. Today's camp is alongside the Tamur River near the small village of Tapethok, 2 hours from Sakathum. (6 hours walking) Overnight Camp. We continue following the east side of the Tamur River to the village of Chirwa with its giant boulders. We then start to climb and traverse the hillside through many scattered villages and woods to our lunch spot. In the afternoon we continue to climb to the village of Phrumba where we camp at the school. (5 to 6 hours walking). Overnight Camp. The morning sees us gaining most of the remaining height before we traverse around ridges and past villages to lunch (31/2 hrs). Now it is an easy traverse around the hillside to Suketar, high above the town of Taplejung. (5 hours walking) Overnight Camp. Today we fly to Kathmandu, first by charter flight to Biratnagar and then by scheduled flight on to Kathmandu where we transfer to our hotel. Overnight hotel. Morning free in Kathmandu for last minute sightseeing and shopping. Transfer to the airport for the Qatar Airways or Gulf Air flight to London Heathrow.